Partly cloudy. Slight chance of a rain shower. Low 46F. Winds N at 10 to 20 mph.. Partly cloudy. Slight chance of a rain shower. Low 46F. Winds N at 10 to 20 mph. FORT EDWARD — A Fort Edward woman has been indicted by a Washington County grand jury for the assault of a National Grid worker last fall. Patricia A. Lafferty, 25, was charged with two counts of felony assault and a felony charge of unlawful imprisonment for a Sept. 11 attack in the village of Fort Edward that left a female utility worker with serious facial injuries. Police said the worker had gone to Lafferty's then-home on Broadway to turn off the electricity when Lafferty became irate and attacked her, punching her face repeatedly and knocking her to the ground. She was charged with felony assault under a law that makes it a felony to assault a "public employee." Lafferty has pleaded not guilty to the charges and is being held in Washington County Jail for lack of bail. 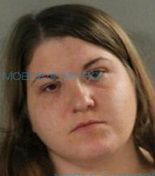 She faces up to 11 years in state prison, and has also been charged with felony grand larceny in an unrelated credit card theft case. That charge was not included in the indictment.